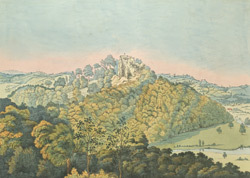 View of the old Dyenvor Castle, also known as Dinefwr Castle, from Newtown House. The castle is situated approximately 1 mile from Llandeilo and occupies a cliff overlooking the River Tywi. A castle existed here by 1163 and although it is not certain that it was built by Lord Rhys I, he did make it his seat of power. The curtain wall and keep were built in the 13th century but as the castle was the object of continual battles for possession it was frequently attacked and was not in good condition. In the 14th century Hugh le Despenser was grated the castle and he added a large hall. The castle was left in ruins in the 15th century when a more modern mansion house was built nearby. The castle was restored in the 18th century as a romantic ruin and tourist attraction with landscaped gardens.